This home has some upgrades since purchased in 2012 for $485,000. Fair enough but if all the work was done with permit (as the listing agent suggests) shouldn't the value of that work be reflected in the assessed value? Assuming BC assessments reviewed the permits. Also, who knows what the value of the permits was and the value of actual upgrades. I put $500,000 down for the cost of construction on the permit, but it could have cost less, or way more to build depending on finishing, etc. If a property sells for significantly more than assessed value, doesn't that often trigger a new assessment? My understanding is that properties that sell 5% above or below the previous years' assessed value they are flagged to be reassessed. (This infor was from my friend who worked as an assessment officer for BC Assessment). Anything near the university that you can cram some international students into will be a money maker for the owner who doesn't care about the purchase price. ^ This property was underpriced IMO. BC assessment figures the lot to be worth $400K and the building to be worth $136K. The realtor did not do the owners any favours by listing it at $600K when the building would cost $260K plus to replace. I would have listed it at $699K and then let the gazumping begin from there. Yeah, I figured it was underpriced, even though it's a smaller split-level with no suite. This nearby 1974 big executive home is in terrible shape, looks dated and ugly and is at $665,000. Too bad the photos don't show the original rec room with wet bar and orange countertops. Edited by Rob Randall, 08 March 2016 - 11:47 AM. It's a feeding frenzy out there. We are looking for a house right now and kicking ourself for not buying last summer. It's pretty insane right now. You have to make an attractive offer on the first day or you have no chance at a decent house. A mortgage broker told me a little while back that a GH house with a suite will bring 50 offers within days of listing. 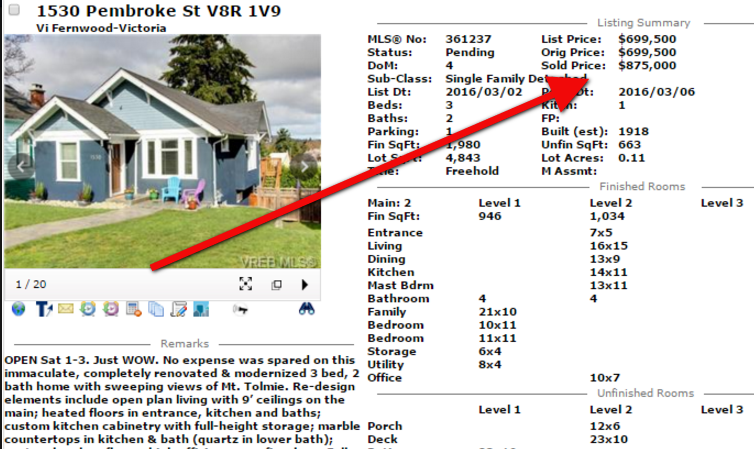 So why aren't we seeing listings at $150-$200k above what the REALTOR wants to list it for? Aren't most sellers aware by now of what's happening? Prices are up 18-20% in certain area YOY so it is taking a while for listing prices to catch up. I think the over ask scenarios are 50% or more of the time to do with a rapidly appreciating market and less than 50% to do with listing agents/sellers underpricing to generate a bidding war. Let me give you an example. I listed a property in the Mt Doug area for 19% more than purchase price last year. We get three offers and two over asking. If one area of town raises 20% while most others raise 10%, after assessment changes, that area that raised more would carry more of the city tax burden, right? I don't think it would make much of a difference. Houses will sell for market value. If they are listed too low they go in a bidding war, if they are listed at market price they go for that price. You're not going to get more for your house by listing it for more. ^ Wow! The price of rice is going up in Victoria. Still half the price of popular areas of Vancouver I guess.